In 2015–16, rice production was valued at $107 million. The Australian rice industry is predominantly located in the temperate climatic region of the Riverina in southern NSW, with a small amount grown in northern NSW and an emerging production area in north Queensland. In the Riverina, the major varieties grown are temperate Japonica varieties planted in October to November and harvested from March to May of the following year. The vast majority of Australia’s rice is exported to Asia, the Middle East, and nations in the Pacific. Market analysis indicates that there is demand across all market segments, both domestic and international, for one million tonnes of paddy production annually. The rice industry is conducting research into suitable varieties and management techniques to allow production in north Queensland. 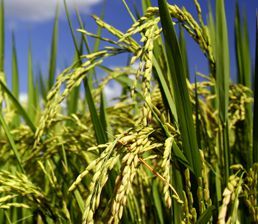 Strict biosecurity measures have been put in place to ensure that any pests endemic in northern Australia are not spread south to the major rice growing area in NSW. The rice industry is covered by version 3.0 of the rice biosecurity plan. Biosecurity planning provides a mechanism for the rice industry, government and other relevant stakeholders to assess current biosecurity practices and future biosecurity needs. Biosecurity planning identifies procedures that can be put in place to reduce the chance of pests reaching our borders or minimise the impact if a pest incursion occurs. 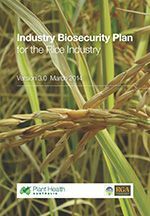 The Industry Biosecurity Plan for the Rice Industry outlines key threats to the industry, risk mitigation plans, identification and categorisation of exotic pests and contingency plans. For a copy, please contact PHA on 02 6215 7700 or email admin@phau.com.au. The following is a list of high priority exotic pests of rice. These pests were identified during the development of the Industry Biosecurity Plan for the Rice Industry in consultation with industry, government and scientists. They have been assessed as high priority pests based on their potential to enter, establish, and spread in Australia (eg environmental factors, host range, vectors) and the cost to industry of control measures. The following is a list of documents for other exotic pests of the rice industry. Please note that this is not a complete list of pests: rather it includes pests for which documents exist in the Pest Information Document Database. Some of the documents presented here are not tailored to the rice industry and are included for information only.